Display beautiful Iris flowers as your screensaver! Includes 50 images, with captions of the botanical names. Select from a number of image transition effects. Use your favorite image as desktop wallpaper. Listen to background music, and more! Relax, and enjoy the colors of Spring, anytime! 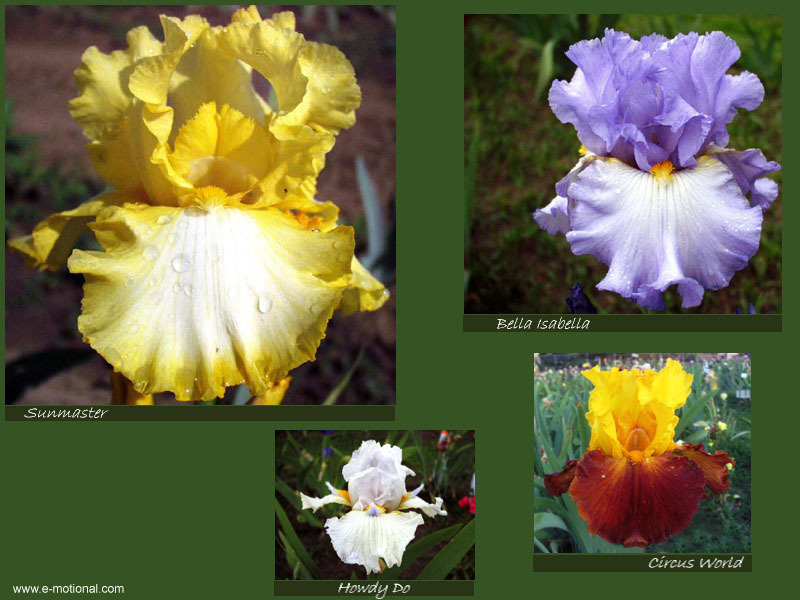 Includes 50 Beautiful Iris Images. Relax, and enjoy the colors of Spring, anytime! 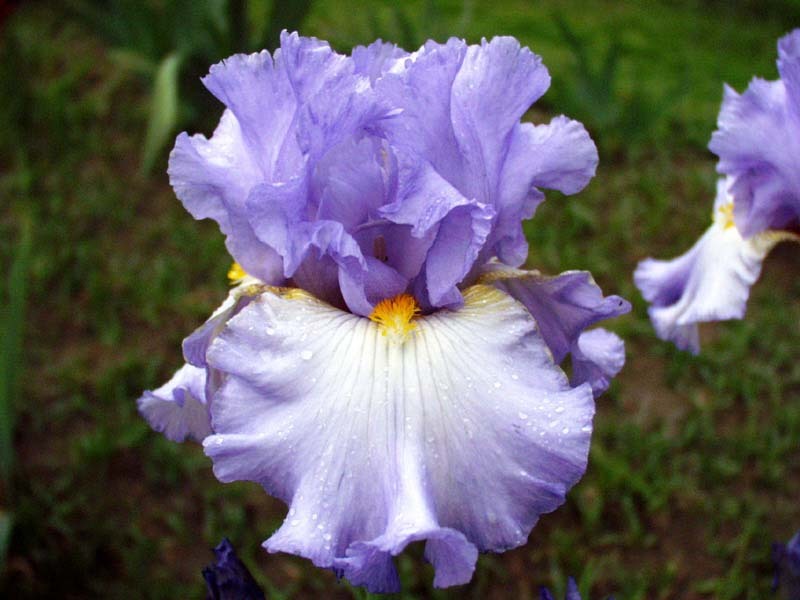 These gorgeous images are courtesy of Sutton's Iris Gardens: California's largest commercial Iris nursery dedicated to growing and supplying quality Iris rhizomes at reasonable prices. Wallpaper. Use any image as your desktop wallpaper. - Or, press "F5" to select current image as wallpaper. - or a personal message in any font and color you choose. English, French, Spanish, Portugese, Italian, Dutch, German and Swedish. - Select your favorite songs. - Select the order you want to play them in. - When the screen saver starts, your music will too! - Supports 12 audio formats including MP3, WAV and MIDI. - You can resume playing the music where it ended the last time the program ran. - Play your music CD's too! Place a CD in your CD-ROM drive, and the the CD will begin playing when the screen saver starts. - A short MP3 clip of Pachelbel's Canon on D Major, performed by Lee Galloway, is included. To learn more about this talented pianist and to download more of his music, please click here. GetRight-compatible! If you use GetRight to download files from the Internet, the Beautiful Iris Screen Saver will show you which files are downloading and the percentage completed. You don't have to disable your screen saver to keep track of your downloads! Enhanced Image Stretching. Our unsurpassed quality stretch option enhances images and removes the "blockiness" that occurs when images are resized to fit the desktop. The end result is just awesome! - Press "F9": to display the next image in the list. - Press "F3": to mute/restore audio. - Press "F4": to advance to the next song in the list. - Press "F5": to set the current image as wallpaper. - Press "F1": to link directly to the e-motional.com website. - Images can be displayed in their original size, or scaled to any size you choose. Scaled images can have their aspect ratio preserved - NO MORE STRETCHED IMAGES!!! - Select how to position your images: centered, at random positions, or have the image float about the screen. - Control the length of time that each image is shown. - Select from a number of transition effects between images. - Set the background to black, or any other color you choose. - Optional Password Protection, to avoid having someone access your computer when your screen saver is on. Select a "splash screen" for your screen saver that will always be displayed first whenever the screen saver runs! - CORPORATE CLIENTS: create a Custom Internet-enabled Screen Saver! Click on Corporate for more info, or contact sales@e-motional.com for more details. Quick-Launch Icon. Click on the Beautiful Iris Screen Saver icon in your Windows tool tray to run the screen saver immediately, or for quick access to the configuration options! True 32-bit application with a real Windows 95 look and feel. 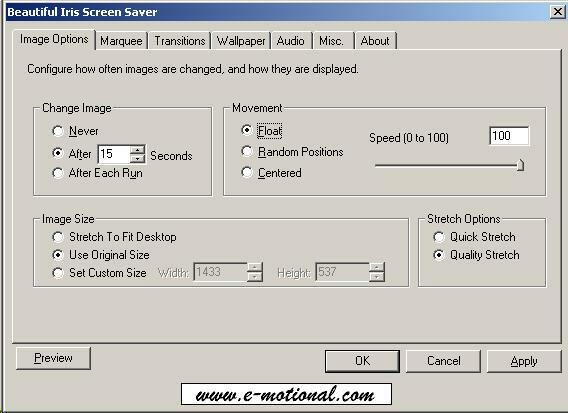 The easy to use, tabbed dialog interface makes customizing your screen saver a snap. Optimized for speed and smooth operation, the Beautiful Iris Screen Saver is compact, and requires no additional DLL's or modules. *NOTE: you must have Windows Media Player installed to listen to MP3 music. a unique feature developed by e-motional.com software! TRICONS blends the program icons on your desktop into the wallpaper image. The icon text blends in with the background, for a result that is pleasing to the eye. Enjoy the beauty of your wallpaper images with less desktop clutter! so you can see the wallpaper image better! and select the 'TRICONS' option at the bottom. 8-bit, 16-bit or 24-bit display graphics (256, 32K, or 16M colors). 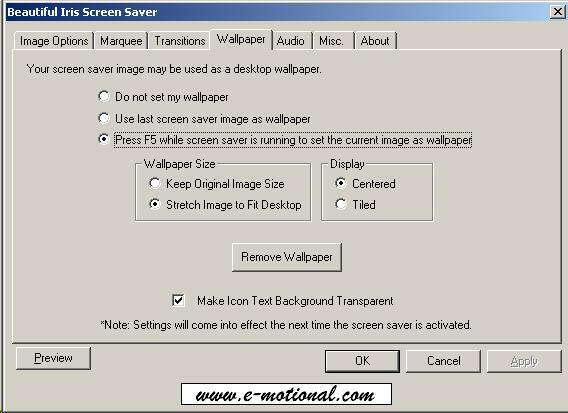 The following images illustrate some of the configuration options and potential uses of your screen saver. Click on an image to see it full-sized. To obtain technical support, select Company on the menu above. Please click on corporate for more details. Download a Free Evaluation Copy! Earn $$ with our Affiliate Program! Do you have a website that offers products or services complementary to ours? Please consider joining our Affiliate Program! You can resell any e-motional.com product, and earn commission on every sale. Copyright © 1999-2003 Esm Software. All Rights Reserved.